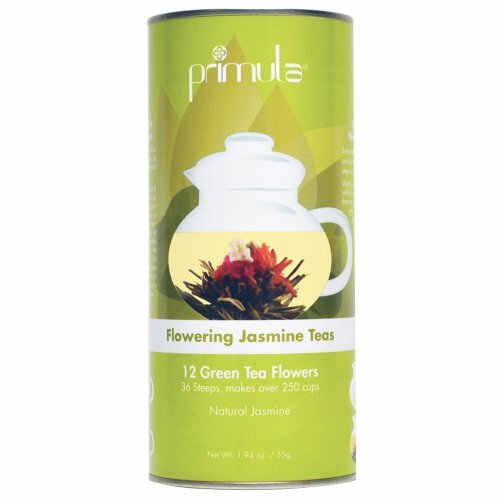 Established in 1991 and located at Boca Raton, FL., Primula Tea has been offering flowering tea balls and accessories which have become a part of their brand heritage over the years. Crafted by artisans in China, each flowering tea ball is created by combining hand-sewn AA grade Green tea with all-natural flowers, which blossom before your eyes when immersed in hot water. Graceful and gentle, these tea balls are best brewed in one of this company’s glass teapots. Each blooming tea ball can be used three times, delivering delicious tea that is also a beautiful work of art and a great conversation starter. Brewing Mugs and Travel drinkware, and PLENTY more! Prepare for an artistic experience that enhances the appreciation of quality tea. Handpicked ingredients include green tea which is blended five times with jasmine, creating ambrosial, floral notes. A gift canister is included, with 12 different flowering teas such as Noble Madam, Floral Passion and Oriental Beauty. Each bud delivers a delicious cup of tea while providing optical beauty that will amaze your guests. This is a wonderful gift idea, which includes a glass teapot, a stainless steel infuser and tea packs in a keepsake bag. The tea packs include: herbal infusions, rose and black tea, green tea and flowering teas which are handpicked and crafted. This is Primula Tea’s largest teapot, which is BPA free borosilicate glass with a decorative glass leaf lid. Also included is a glass infuser and three flowering teas. You can select additional assorted teas to create a perfect gift for the discerning tea sipper who appreciates artistic beauty. NOTE: This teapot is currently on special for only $2.00… don’t miss out! Primula Tea also provides Tea Bag Buddies, which are silicone tea bag holders that also act as lids for your cup. You can squeeze your tea without burning your fingers and they come in different colors. If you’re looking for something out of the ordinary, then this tea company is for you.